We’ve all heard of vision boards thanks to the movie The Secret. I always liked the idea of a vision board to help me get more visually focused on my goals but what I did not like was the blatant display of what I wanted in life. It made me feel a bit vulnerable. I didn’t want my family and guests in my home to give their opinions of my visions. I wanted my visions to be MY visions and was not interested in other people’s criticism or opinion of them. However, I have recently discovered something even BETTER and more FUN than my mini vision boards and they are called Vision Books! The vision book idea came from my friend Marilyn LoRusso who runs the Vision Book Art Workshops in Marin County, California. 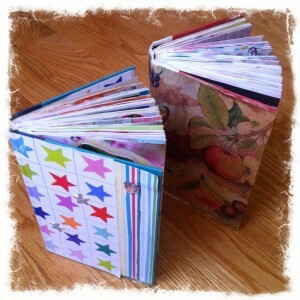 She leads us through creating vision books re-using old, hard cover novels, that we alter. Tucked inside those pages are my visions and dreams wrapped up in a pretty package. Marilyn’s workshops have been so successful she is now offering an online version of her workshops, it’s actually an 8 week vision book rainbow journey, as she calls it. Oh and you don’t have to be “woowoo” to benefit from Marilyn’s workshops. Our local newspaper, the MarinIJ recently wrote a piece about the workshops. When I started taking the workshops I had no idea where I was going with my vision or what my vision even was. I just new I was ready for a change. A lot of wonderful things have changed in my life in the last year. If you are feeling overwhelmed and unhappy with your life, it is time to give yourself a break and take care of yourself. Creating a vision book is one way of doing this. Click here for information about the upcoming Vision Book Workshops at Rileystreet Art in San Rafael in January! Vision Book Your Dreams for the New Year!